Bundled in The Zork Anthology. The Original MDL mainframe version predates the later versions released for micro computers. This version contains content of all 3 of the original games. An interpreter to run it in its original form is available here. The FORTRAN port can be found here with an older Mac version (PowerPC and intel 32) available here and Windows 64 compatible version here. Source to this version can be obtained here. Additionally a port of the mainframe version to z-machine can be found here. 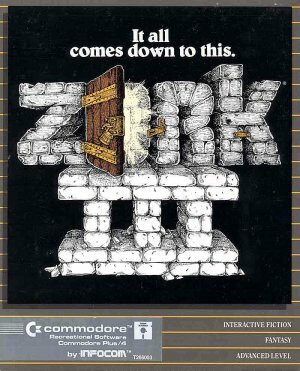 The Zork Anthology is a compilation pack containing Zork: The Great Underground Empire, Zork II: The Wizard of Frobozz, Zork III: The Dungeon Master, Beyond Zork, Zork Zero, and Planetfall. A Z-machine standards document is available for those wishing to make their own interpreter. A list of various Zork related tools and utilities can be found here. All on-screen content is text only. ↑ 1.0 1.1 File/folder structure within this directory reflects the path(s) listed for Windows and/or Steam game data (use Wine regedit to access Windows registry paths). Games with Steam Cloud support may store data in ~/.steam/steam/userdata/<user-id>/570580/ in addition to or instead of this directory. The app ID (570580) may differ in some cases. Treat backslashes as forward slashes. See the glossary page for details. This page was last edited on 28 March 2019, at 01:36.